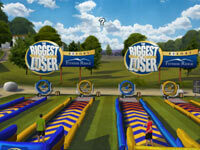 The Biggest Loser Ultimate Wor..
2-4 player support online. View larger. Unique Kinect enabled events. View larger. 6 environments with 5 settings. View larger. Preset& customizable options. View larger. 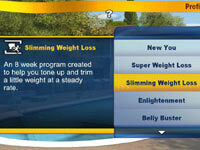 I enjoyed the biggest loser on the wii, but found it frustrating. If the controller was low on batteries or if you didn't pass it in front of the sensor just the right way, or if you punched too hard it wouldn't register and no matter how hard you actually worked, you'd get a low score for your work out. It was also hard when they wanted you to put the controller in your pocket for certian work outs, and I didn't have pockets in the pants I wore to work out.So when they came u..